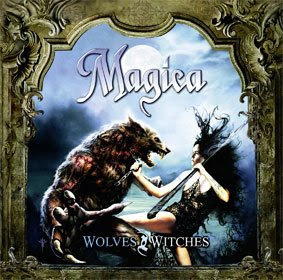 Hall of the Mountain King: Review: Magica, "Wolves & Witches"
I’ve been on a roll of good female-fronted records lately — Luna Mortis, The Agonist, Lacuna Coil — so I suppose it was just a matter of time before I got another one of these. Wolves & Witches has a few things going for it. Musically, it’s some pretty solidly played traditional metal. It’s something I could definitely listen to, and in fact, there are bits and pieces that I really enjoy. But it has one great, big, honking problem — vocalist Ana delivers that same old tired semi-soprano female voice that we’ve heard thousands of times. It was interesting 10 or 12 years ago when we hadn’t really heard it before, but now it’s just tired. For one thing, very few bands actually integrate it into the music, and the vocals end up feeling like they’re laid on top of what the band has done instead of being part of the band’s work. That’s definitely the case here, particularly on songs like opener “Don’t Wanna Kill.” For another, you really have to be good at it to convince people to listen to it for an entire record. The vocals here often sound too sharp or too flat, particularly when she goes into hysterics. The band dips into what seems to be a growing nostalgia for 1980s pop rock and new wave on the opening of “Hold on Tight,” before trying to go for a Lacuna Coil sound that just lacks the cohesion of the band it’s emulating. They go full opera on the ballad “Maiastra” which just seems out of place. As I said before, there are things I like about this record. The bouncing opening riff of “Dark Secret” is top-notch, and I even like the ’80s-style “dark secret” refrain on the chorus, but there are those vocal issues again on the rest of the song. The traditional riffing on the opening of “Mistress of the Wind” is catchy and memorable. The instrumental “Chitaroptera” is the shining star on the record with its blend of exotic and heavy riffing. It’s really the only song that I’ll probably take away from this record, and it leaves me wishing they were an all-instrumental band. There’s some promise here, but unfortunately, outside of “Chitaroptera,” which I really like, Wolves & Witches just leaves me with a headache.